Advice: Believe in yourself so that others will believe in you. Have the confidence that what you learned works and stand behind it. Always be professional. Wear clean clothes, tuck your shirt in, keep your back straight and exude confidence. August 2006 - Mary Lew Johnston always loved horses. While she thought about attending Meredith Manor on and off through high school, graduation found her doing other things. She worked as a trail guide at a rental barn, managed some small barns, put in time as a restaurant cook, and spent a summer with a touristy carriage concession at a North Carolina beach. From the get go, Mary Lew emphasized her studies in Western disciplines because she knew that’s where she wanted to land after graduation. “Meredith Manor is a little different from the mainstream Western industry,” she says. The “heeding” groundwork taught at the school, its emphasis on methodically working a horse up through the steps in the training tree, and the terminology she encountered were different from the standard techniques used by many Western trainers. As graduation time neared, Meredith Manor suggested that Mary Lew post her resume on Equimax. She believes that her Meredith Manor credentials definitely helped her land that important first job at Mathis Quarter Horses in Laurel Springs, North Carolina, where the emphasis was on breeding horses for reining and cutting. She also feels that the communication skills and skills in dealing with adults that she learned on-the-job before attending Meredith Manor were also an important factor. Right out of school, Mary Lew began training three 2-year-olds. The following year she had six. She started them with a lot of groundwork, got them under saddle, and helped decide if they were better suited for reining or cutting. Since there were no cows on the farm, cutting prospects moved on to a trainer in Alabama. “We sent two down there and I asked him to tell my boss what he liked and what I needed to do that I hadn’t done,” she says. “He said they were the best trained horses he’d ever gotten from Mathis.” That validation gave her a big boost. Mary Lou enjoyed another sense of accomplishment when her boss suggested they enter a particularly nice 3-year-old in a ranch horse competition. 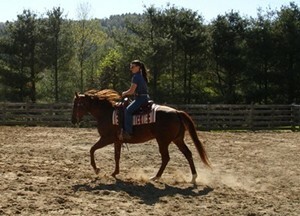 Trail riding was the biggest challenge the horse had faced up to that point, she says. In the competition, he would be required to ground tie, have his bridle removed and have it put back on. The rules called for spins, roll backs, a sliding stop, a lope with lead changes, and ride through a herd of cows to separate one out. Mary Lew went to work. “I didn’t do a lot of maneuvers,” she said. “I just really got him working off the inside leg, did lots of transitions, lateral work, and asked him for as much contact as he was ready to give me.” The weekend before the show she took the gelding to a nearby farm, rode him through a herd of cows and moved cows from one corner of a pen to another. While Mary Lew loved working with the youngsters at Mathis Quarter Horses she saw her dream job as one that involved teaching and contact with the public. So she jumped when an opportunity to work in the stables at Leatherwood Mountain Resort in the Blue Ridge Mountains near Boone and Blowing Rock, North Carolina. 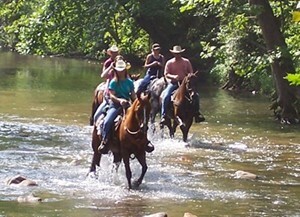 “Leatherwood Mountain is a resort community centered on an equine lifestyle,” she says. “I split my time between training trail prospects, giving riding lessons, and guiding trail rides for guests,” she says. “I’m really excited about this place for several reasons. Leatherwood is where I grew up and I consider it my home. The people I work with are very passionate and compassionate about their horses. 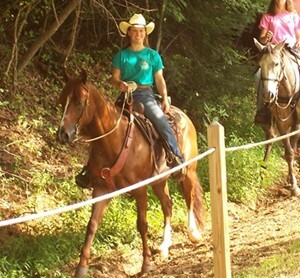 It creates a very positive working environment for me as well as a positive learning environment for the horses. Mary Lew advises those just starting out in their careers to look at the whole package they are offered. Starting salaries for those coming right out of school will vary, she says, depending on the type of job and the geographic area. In her area, for example, a starting salary of $250 is typical. A generous benefit package that includes a stall for a horse, housing, and health insurance can help balance the low salary. “A lot of horse people don’t have cash money,” she says, “but the benefits easily make up for that.” And, she mentions again, the biggest benefit of all is getting paid to do what you love to do anyway. If you would like to be considered as a Feature Graduate, send an email to with your name, grad year, and a brief bio. Meredith Manor is far more than "just" an equestrian centre. Ron and Faith, I wish for just one moment you could feel the gratitude I have for you and what MM means to me. There will always be a little bit of my heart there. Thank you for such a wonderful education in many areas of my life!